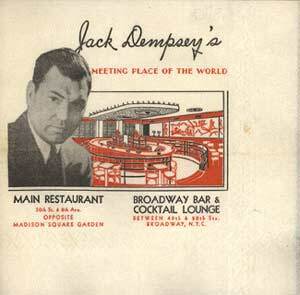 A Broadway eatery owned by former heavyweight champion was a New York City hot spot for many decades. Visitors could often find the ex-champ on the premises greeting his fans and customers. (My grandparents met Mr. Dempsey that way!) Menus from the restaurant made excellent souvenirs.